MP4 No Sound Problems Fixed! MP4 No Sound Troubleshooting: MP4 Has No Sound Issue Solved! Have you ever encountered a situation that MP4 videos play well with high quality images but no sound no matter on Windows Media Player, QuickTime, VLC, or Media player classic etc? It is like viewing a silent movie! Actually MP4 no sound problem on iPhone or computers is quite common when playing videos. It's really annoying and you have to spend a lot of time troubleshooting. To finally fix the problem, you may have to find out the true cause that MP4 video file has no sound. And then what can we do to get MP4 no sound fixed can be taken into consideration. Here, we list the common situations and reasons of not getting any sound in an MP4 file, along with tips to solve the issue using MP4 video transcoder. MacX Video Converter Pro - Convert unrecognized MP4 videos to MP4 with right codec H.264/AAC or MPEG4/AAC and repair corrupted video file to be saved in MP4, FLV, AVI, MKV, WMV etc, for good compatibility with QuickTime, VLC, Windows Media Player, iMovie, Final Cut Pro, iPhone, iPad, etc. No more MP4 audio/video sync error. 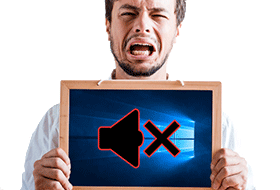 Situation 1: No Sound When Playing MP4 on WMP, VLC, QuickTime etc. Why MP4 Has No Sound on Windows Media Player: That is because the audio codec of your MP4 file is not supported by WMP. Windows Media Player supports only certain type of Codec. To make WMP support MP4 format, you should install filters for MP4 format and its associated codecs. After you installing these filters, all players that use DirectShow technology, include WMP, will support MP4 format. Click to see other issues like Windows Media Player not playing AVI. The Reason of iMovie MP4 No Sound: Technically, iMovie does import MP4 video. 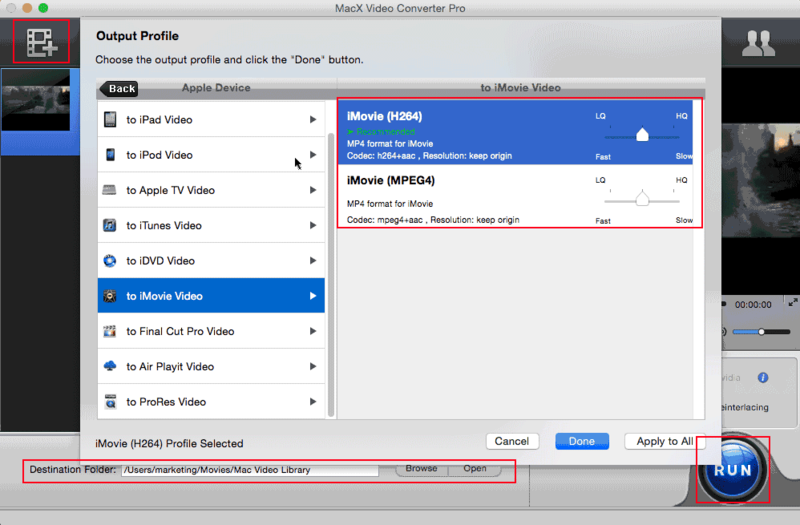 However, iMovie only import MP4 files that are encoded with MPEG4/AAC or H.264/AAC data. And yet, MP4 is a video container format that may contain various audio and video codec (and sometimes even subtitle streams included). If the MP4 file is not encoded with iMovie support codec, iMovie will refuse to import this kind of MP4 video. So the essence is to know best formats for imovie. There are various reasons causing MP4 having no sound. According to the above two situations, the unmatched codec of MP4 can be the main reason. And apart from this, corrupted media player installation and corrupted MP4 files can lead to MP4 no sound problem as well. If MP4 plays but no sound owing to the corrupted media player installed, you can simply uninstall it and reinstall the right one. Or if the MP4 files are broken, you can also repair corrupted MP4 according to the extent of damage. 1 Try to play the silent MP4 files in several media players like VLC, Windows Media Player, QuickTime, KMplayer, 5KPlayer etc. on your computer and see if the MP4 no sound problem is reproduced. Specificlly, try playing the problematic MP4 file in any of the above players. If the file doesn't have any sound in these other players either, note if there is an error message displayed when you try to play the file. This will help you find out the true causes of no audio for mp4 video files: on account of the faulty codec or corrupted media player installation. 2 Convert the no sound MP4 video to any other formats compatible with the media players such as Windows Media Player or edit tools like iMovie, Final Cut Pro etc. As it is mentioned, the main cause of MP4 no audio track issue is the unmatched codec. 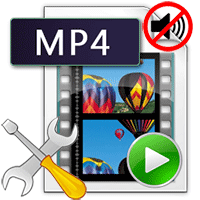 In order to successfully import all kinds of MP4 files to iMovie or play MP4 files well on WMP, a recommended solution is to convert the MP4 files without sound. For this purpose, a awesome MP4 video converter is in demand. MacX Video Converter Pro is highly recommended since it is built in 370+ video/audio codecs. It always behaves well in converting any video audio formats, owning to the built- including FLV, AVI, MOD, DivX, XviD, WMV, WebM, MKV, MTS/M2TS etc. or MP4 of H.264+AAC codec and MPEG4+AAC codec. Step 1: Free download the MP4 video converter or Mac version and launch it. Click "+" to load the MP4 file without sound. Step 2: Choose the output format from the automatically popped up window. 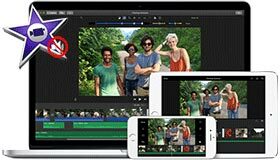 Here MP4 with h.264+aac or mpeg4+aac codec is wildly chosen for the compatibility of mainstream media players and iMovie, iTunes etc. Step 3: Specify the output folder to save the converted videos without MP4 sound problem. Step 4: Hit "RUN" button to start converting the no sound MP4. You can view the conversion progress and are able to cancel the converting process at anytime. An extremely short period is need to get MP4 no sound fixed. Besides, YouTube video no sound problem, Facebook no sound issues can also be effortlessly solved with this video converter in similar steps. No Sound on YouTube Videos? Let's Fix YouTube Sound Problem! YouTube audio problem: no sound from YouTube videos? Big deal? Of course not since here I will tell you how to fix YouTube video no sound/audio problem with easiest way. Having Facebook videos no sound problem? Comprehensive fixes to different no sound on Facebook errors here will solve all the Facebook video sound not working issues on computer, Android, iPhone, iPad, Chrome etc. Here's top MP4 joiner software review, covering the fastest MP4 merger that supports to combine MP4 file of different res, codecs, screen size etc. without re-encoding, online MP4 merger, and MP4 joiner freeware, with how-to guide added. MacX Video Converter Pro is an all-in-one video editor and converter with top quality and fast speed. This feature-rich video converting software also can help you easily download HD or SD videos from YouTube, Vevo and more 300+ sites.